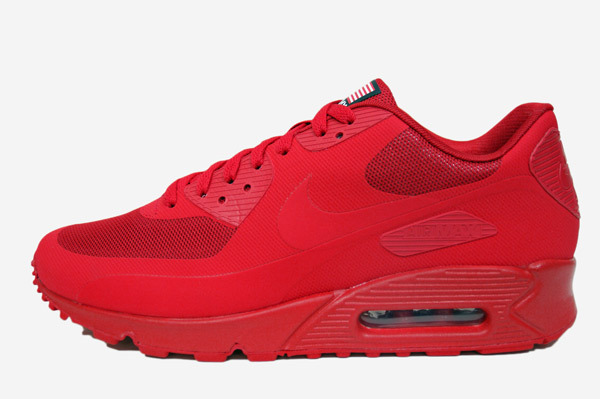 Nike Sportswear celebrates the 4th of July with a new Air Max 90 Hyperfuse quickstrike. It might not be the all red sneaker Nike Sportswear fans were hoping for this summer, but the new Nike Air Max 90 Hyperfuse QS "4th of July" should still make waves in the coming weeks. Dressed entirely in sport red, this upcoming Air Max 90 release features a special American flag emblem on the tongue, celebrating the July holiday. Look for the Nike Air Max 90 Hyperfuse QS "4th of July" in Sport Red, along with two accompanying colorways, to release later this month at select retailers.